, and are one of the only retail suppliers of this rare and important precious metal in the world. Iridium is a member of the platinum metal group first discovered by Smithson Tennant in 1803 who named it after the Greek goddess, Iris, the personification of a rainbow, because of the striking and diverse colors of its various salts. Iridium is one of the rarest elements in the earth’s crust, with annual production and consumption of only three metric tons. 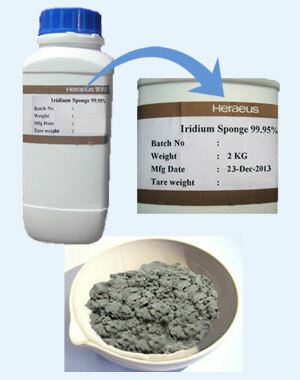 Iridium is used in a number of organic compounds as industrial catalysts and in research. It is employed in high corrosion resistance and high temperature required situations, such as spark plugs, electrodes, and crucibles for re–crystalization of semi–conductors. Shipped in sealed plastic buckets containing powder iridium in various quantities. Minimum order 10 OZ. To view all rhodium, iridium, and ruthenium products, click here.